Having just emerged from what he called an "open and candid exchange" with the parties to the Iran nuclear deal, Secretary of State Rex Tillerson said President Trump had made up his mind about whether to walk away from the deal, but wouldn't tell the public or other world leaders yet. Taking questions from reporters, he repeatedly emphasized the "significant issues" Trump has with the pact. "I think it's pretty difficult to say that the expectations of the parties who negotiated this agreement have been met. Perhaps the technical aspects have but in the broader context the aspiration has not." One eyebrow-raising quote: "Prime Minister May [of the U.K.] asked him if he would share [his decision] with her and he said no." On Trump's pronouncement that he's made up his mind: "I didn't know he was going to say today he made a decision. I knew he had." Iran's violations of the "expectations" of the deal: "Since the agreement has been confirmed we have seen anything but a more peaceful, stable region." 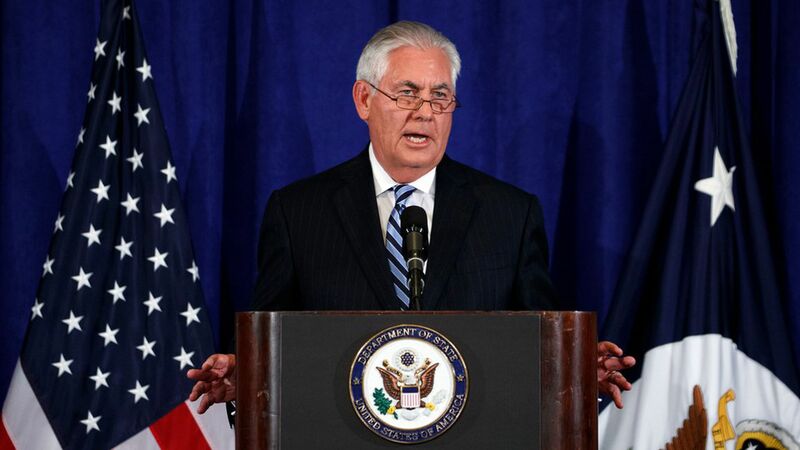 Tillerson cited Iran's cyber activity, missile tests and support for Bashar al-Assad. On the current U.S. stance: "We expect Iran to fill its commitments, until that time we'll consider our commitments and the president has the matter under consideration." On whether backing out of Iran would undermine attempts at a North Korea deal: "An agreement we would strike with North Korea would be of a very different nature." The European stance: European Union foreign policy chief Federica Mogherini said after the meeting that all parties agreed Iran is living up to the agreement, and that she didn't see any need for renegotiation.